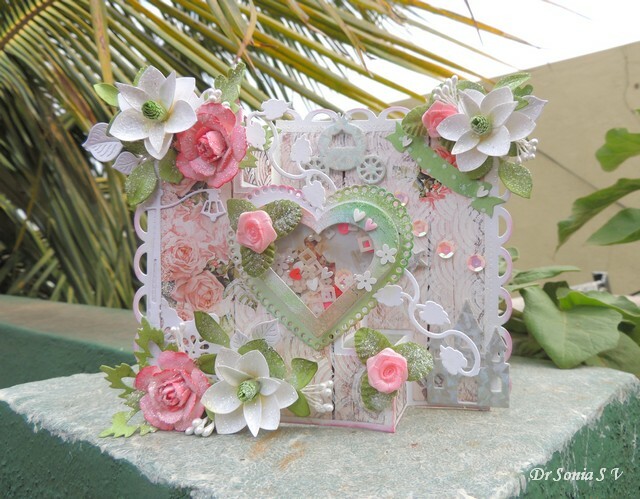 Hi friends sharing a Step Pop Up Card with handmade roses and magnolias made with Spellbinder dies. 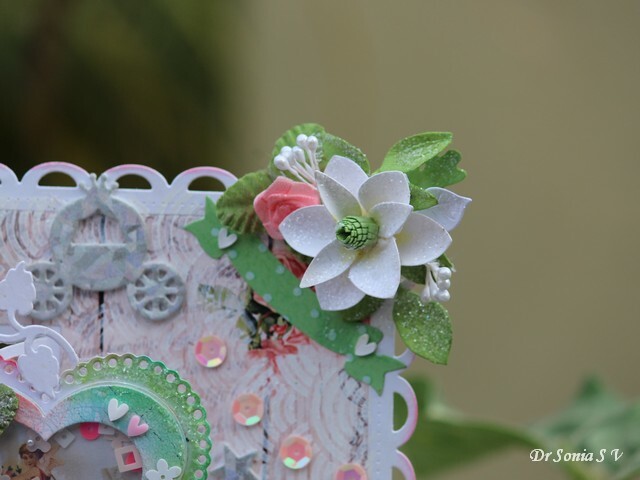 I love the green- peach pink color combo and for once this card came together easily though a lot of work was involved in making the handmade blooms! 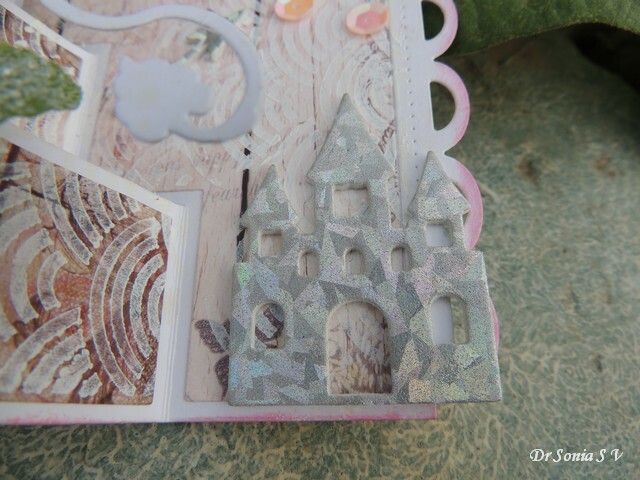 I love playing with dies and added a castle, magic wand and chariot on one side of the Pop Up Card . 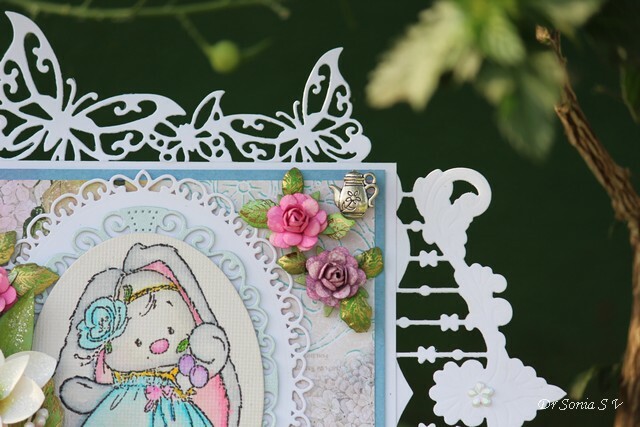 Used the Spellbinders Pretty Princess die to cut them from designer foam. 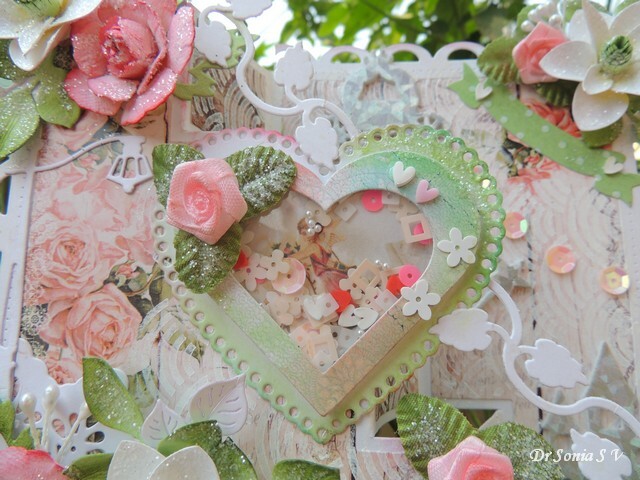 One corner has another Magnolia flower,a ribbon rose and a green die cut banner with cute tiny white hearts! 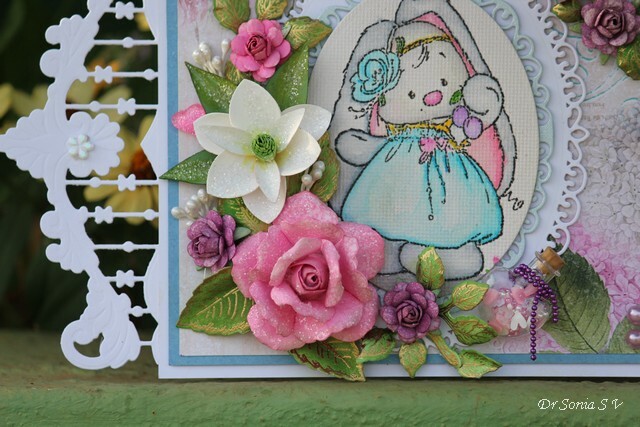 The ribbon roses were a pale pink in color and I matched them to go with the rest of my card using Distress Inks ! 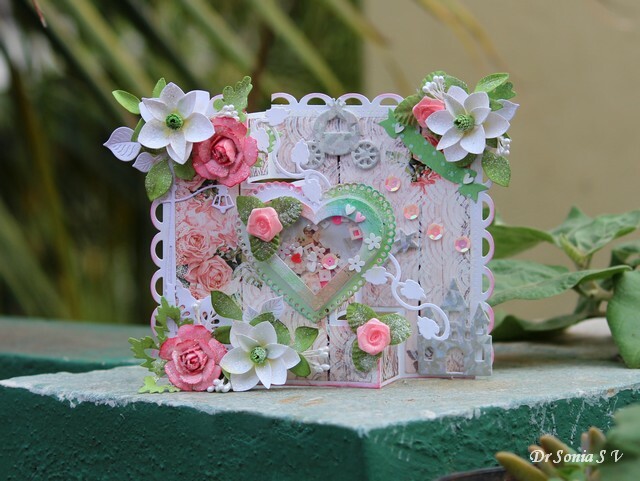 The pattern paper background was toned down using white acrylic paint and Carabelle Studio Geometrie 1 stencil and helped add to the Shabby Chic look! 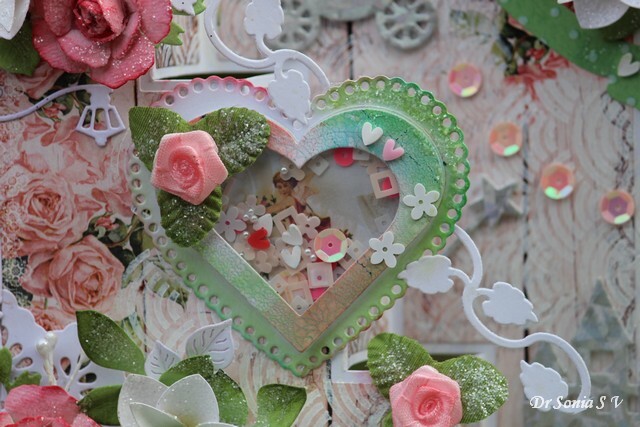 I hope you liked this Pop Up Card with handmade flowers galore. 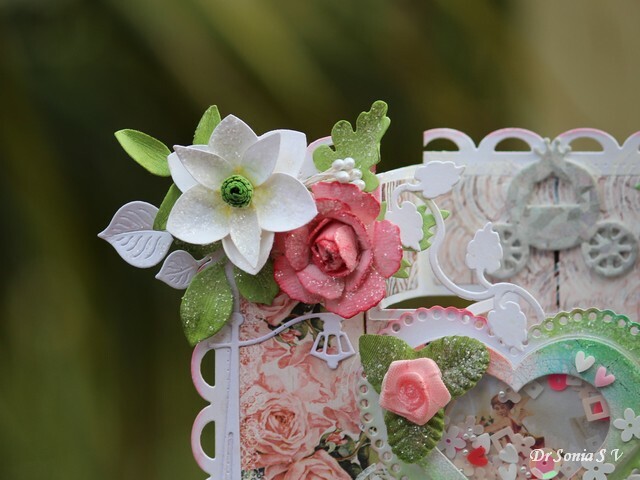 Hi friends, this card combines a lot of things I love...die cutting, handmade flowers and experimenting!! The experiment is my baby steps into coloring stamps! 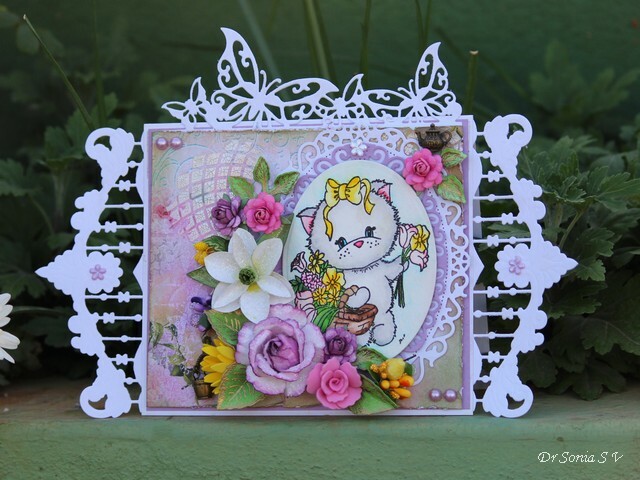 The little kitten with flowers is a clear stamp from Crafty Sentiments I had won way back in 2011[see post] but only now worked up the courage to showcase in a card! 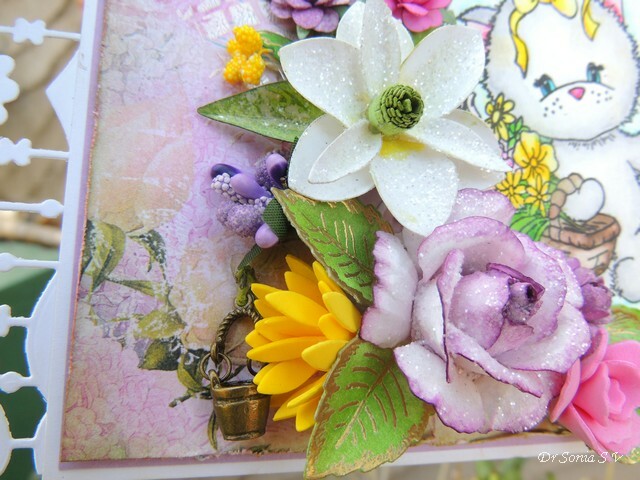 This card has an array of handmade flowers and here are the dies I used to make them. 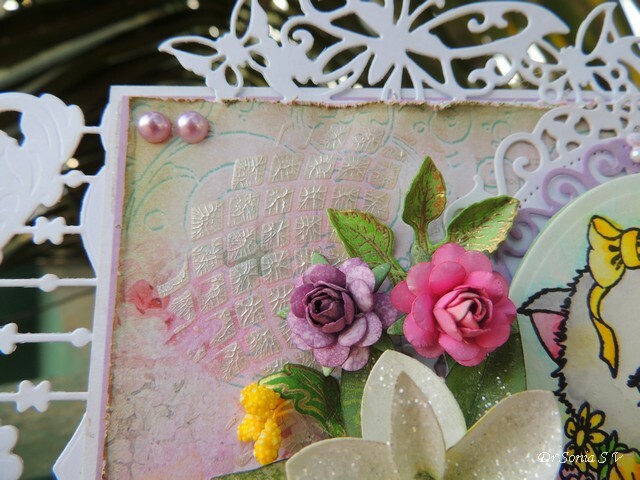 I used a pretty paper from Lemoncraft and added some stenciling with Platinum crackle paste on one corner. 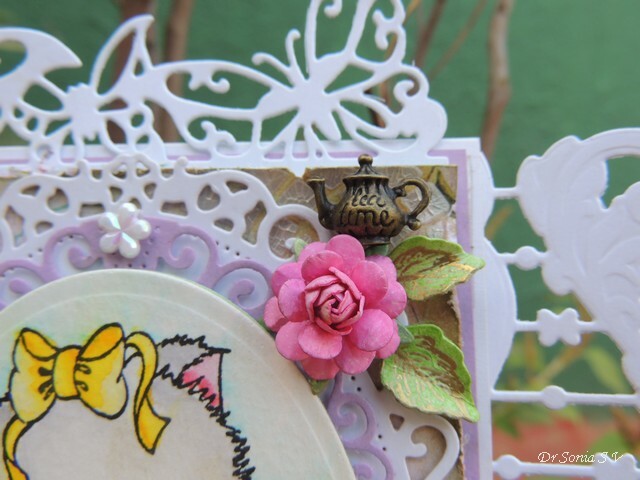 The cute little teapot is a metal charm and so is the little bucket hanging from under the flowers! 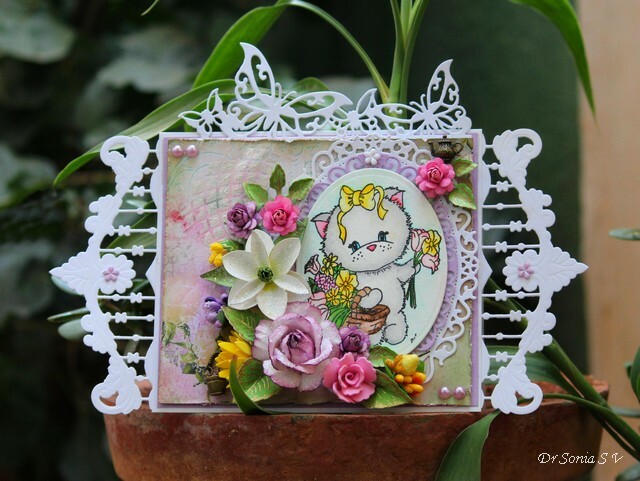 The cute kitten was colored with zig watercolor brush-pens and though awash with imperfections I talked myself into using it on this card! I am not a natural as far as coloring skills go but slowly trying to actively work up the patience to color stamps and build up the courage to blog my amateur attempts !! Hi friends, Thank you so much for all the love showered on my DIY Christmas Tree Tutorial ! 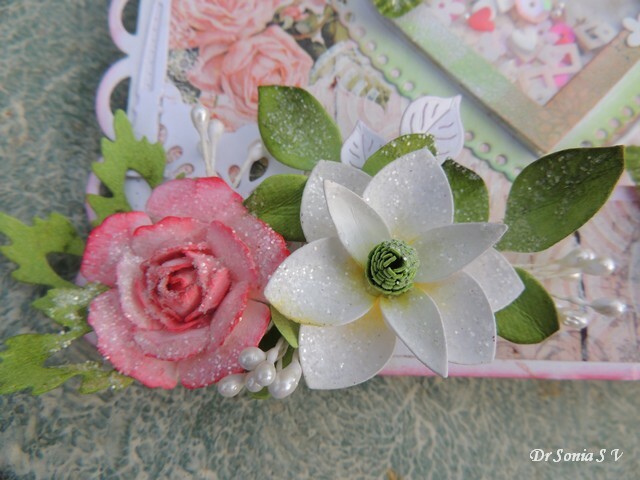 I am on a flower making spree and made not only the magnolia but the big mottled pink rose and all the tiny roses on this card. 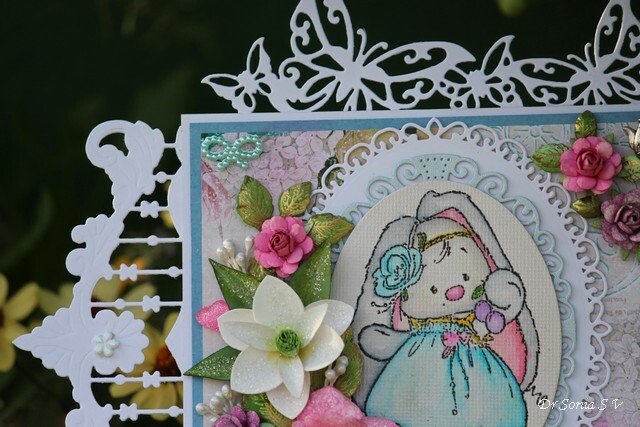 I usually dont use stamps as the focal image of my projects but this cute little bunny deserved nothing but to be the star ! 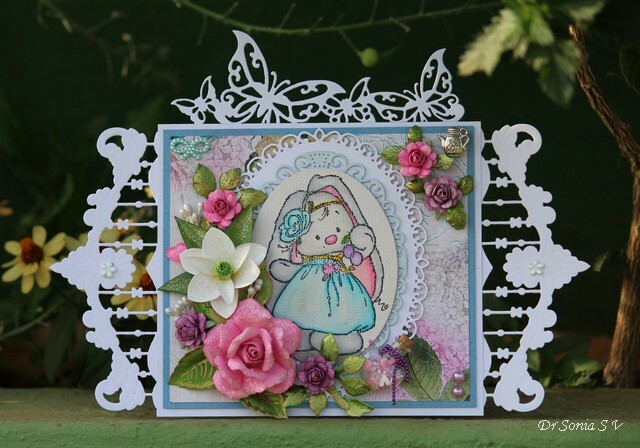 Its a clear stamp from ScrapBerry called Bunny and Plums and I think it's my all time favorite stamp!! I am not an expert at coloring but happy with my amateur attempts at water-coloring with zig brush pens...what do you say my friends....?! 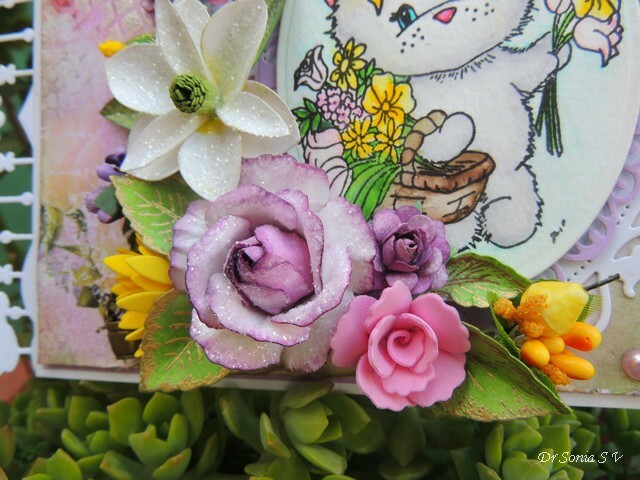 The tiny roses were made with Cheery Lynn dies and I got the mottled look by first sponging the flower die cuts with Distress Inks and then misting with water before shaping them into roses. The little teapot is one of my favorite metal charms! 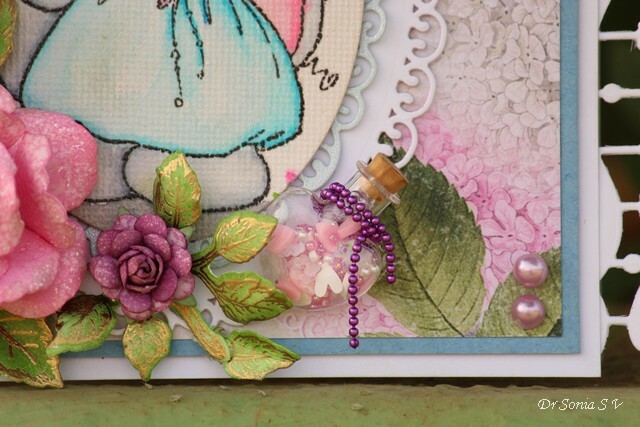 Added cute little pink and white hearts and sequins inside a teeny bottle! 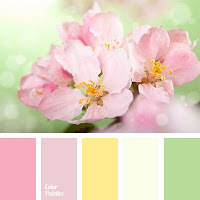 I think this card would be apt for a little girl...what do you say my friends? 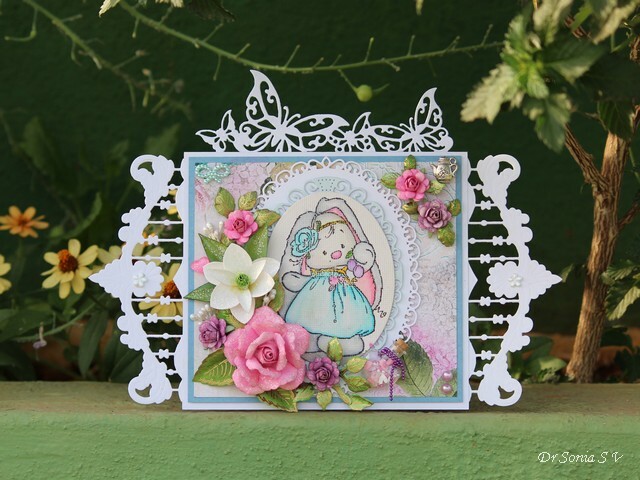 Double D challenges Think Spring- my card has lots of flowers galore and a little bunny for spring! !